Playing an essential part of any tourism, the cuisine is what worldly wanderers desperately want to explore whenever they step into a new land. Playing an essential part of any tourism, the cuisine is what worldly wanderers desperately want to explore whenever they step into a new land. 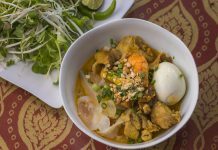 There are many dishes unique to each country that should be enjoyed at least once in a lifetime and there are many Vietnamese dishes that fall under that category. These are 9 examples of must try dishes when in Vietnam. The most popular among all Vietnamese dishes is the one and only – “pho” which is also the country’s de-facto national dish. It is usually also the first dish foreigners talk about when Vietnamese cuisine is mentioned. In 2011, CNN also ranked this noodle-dish as one of the most delicious dishes in the world. Pho refers to a type of rice-noodle soup served with various kinds of meat (usually beef or chicken), bean sprouts, lime wedges, essential greens (basil, mint, cilantro, and onions), and whatever chili sauce and fish sauce you need to match your taste. In fact, you can easily encounter pho stores everywhere across the country and this wide popularity brought many variations to the dish. 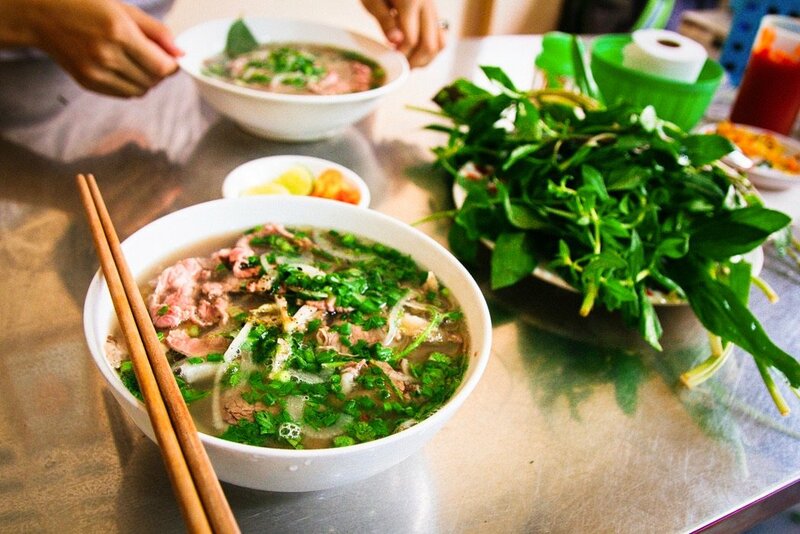 However, the authentic “pho bo Hanoi” (Hanoi beef noodle) receives more love from food enthusiasts in general. Pho is not too expensive, easy to eat, and definitely impressive in flavor. Once described as “One of the world’s finest sandwiches” by BBC, banh mi is addictive thanks to the uniqueness lying not only within the crispy French-influenced baguettes but also in the flavor packed, savory Viet fillings. These signature baguettes are usually stuffed with a meat of your choice (grilled pork, bbq beef, or shredded chicken), vegetables, a variety of sauces, and my most favorite part, an extra sunny side up egg. 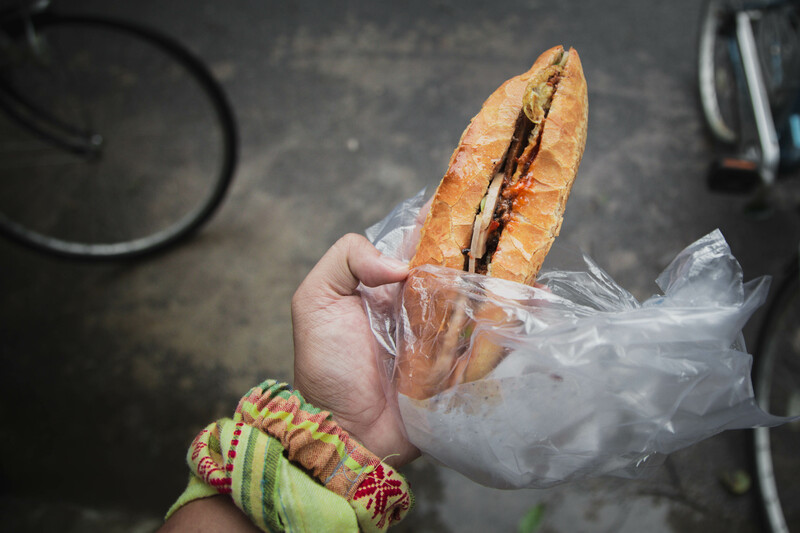 Available at almost every street corner, banh mi is a perfect choice if you are in a rush or just want to temporarily appease your hunger. Vietnam has a number of noodle dishes and some of them represent a part of the country. 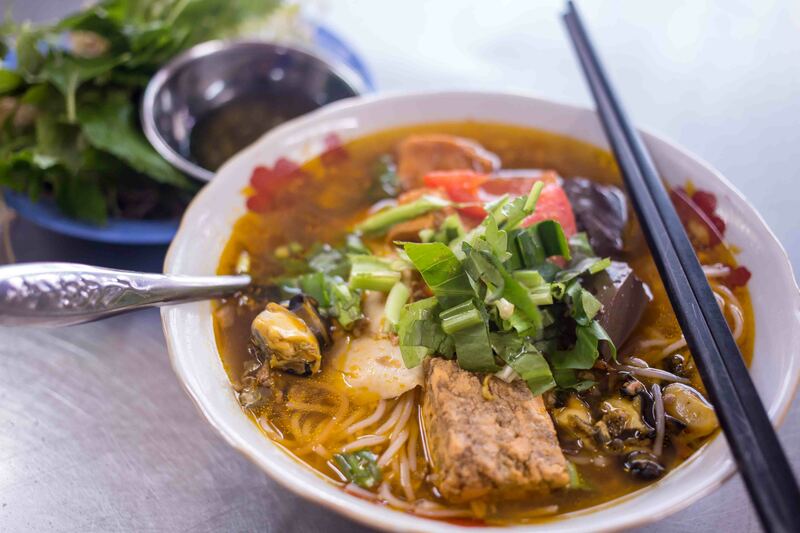 If Hanoi is represented by bun cha and Hue by bun bo, then bun rieu is seen as the most suitable representative for the South. 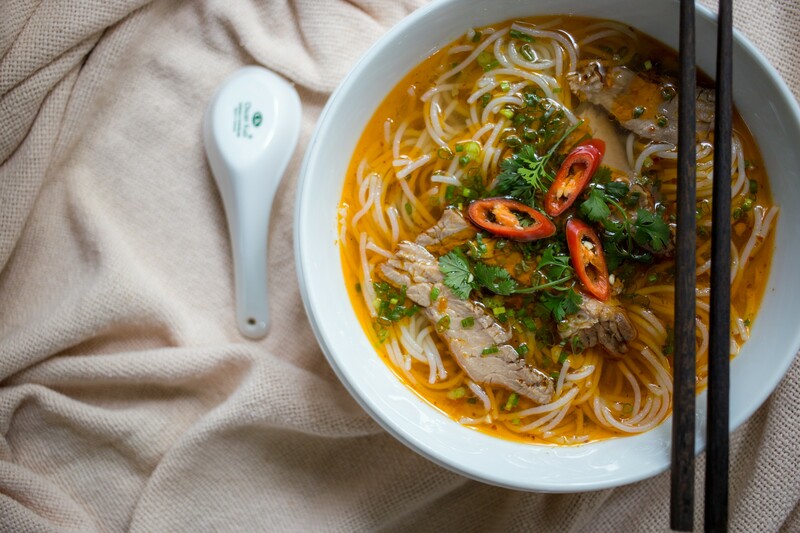 Consisting of crab and rice noodles, bun rieu is a well-known traditional dish and in 2012, CNN named bun rieu of Vietnam as one of the most attractive dishes in Asia. As stated above, bun cha is definitely a must-try dish when you want to have a better understanding of the national cuisine. 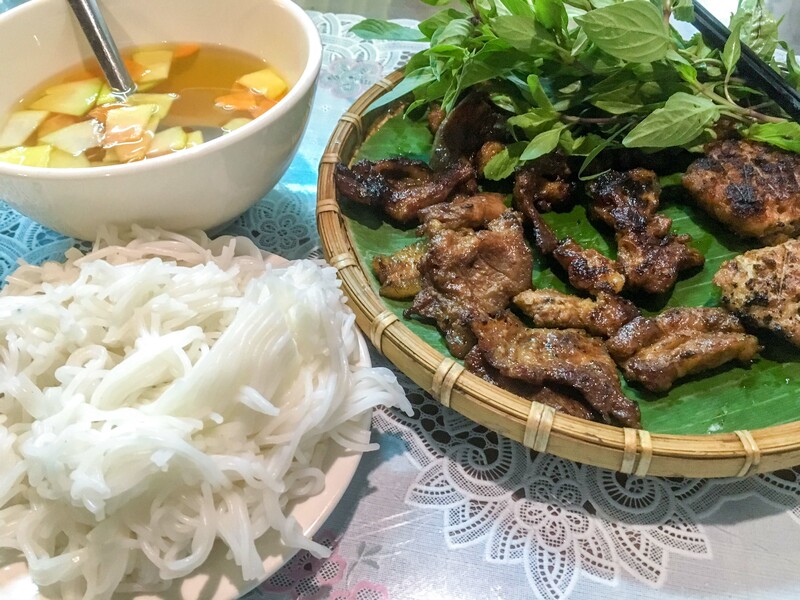 Originated in Hanoi, the capital of Vietnam, bun cha is served with grilled fatty pork (cha) over a plate of white rice noodle (bun) and herbs with a side dish of slightly sweet sauce. The strong flavor of the pork, combined with the sweet & sour sauce and fresh vegetables create a taste that is more than awesome. In this list, we recommend three kinds of bun and the last one on the list is bun bo Hue. 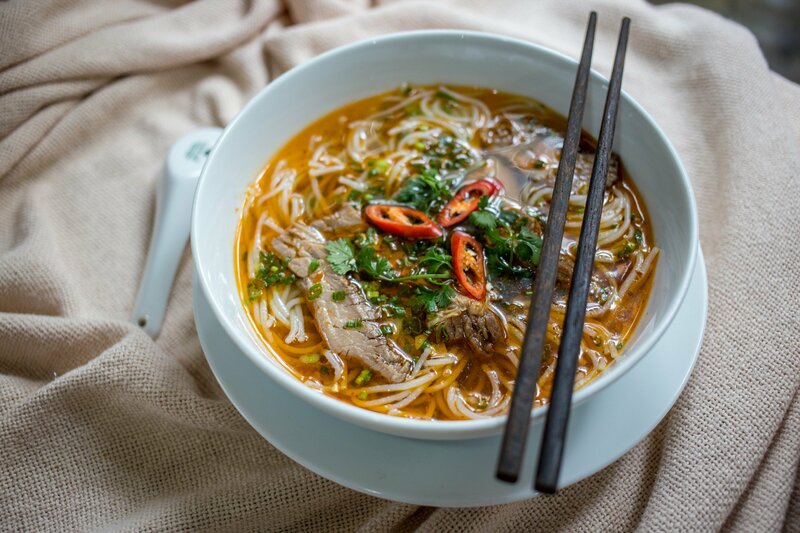 This type of noodles originated in Hue, the former capital of Vietnam and like other dishes that originated from the region, bun bo Hue is really sophisticated in flavor. The broth is prepared by well-simmered beef bones and beef shank with lemongrass and then seasoned with fermented shrimp sauce and sugar. Later, very spicy chili oil is added during the cooking process. Vietnamese dishes are more than noodle-based dishes, and banh xeo is one of the hidden gems. 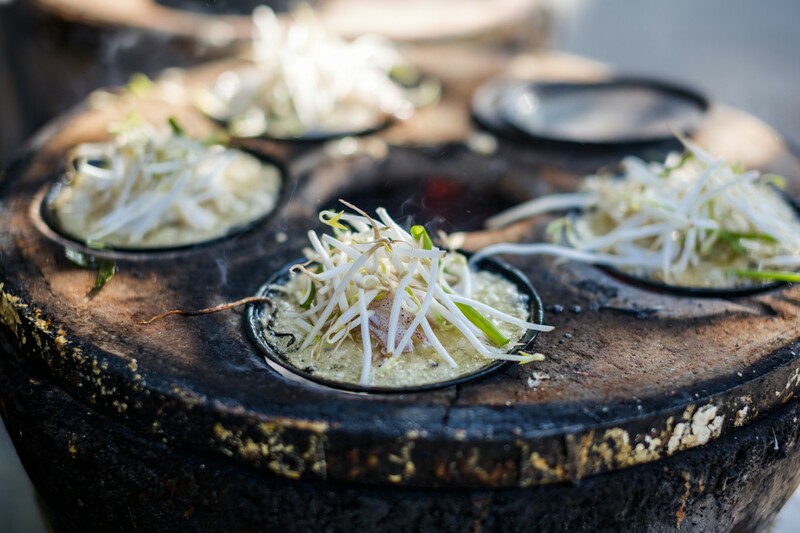 Banh xeo literally means “sizzling cake” in Vietnamese. “Banh” means cake while “xeo” is an onomatopoeic word alluding to the sizzling sound the batter makes when it hits a hot frying pan. The cakes are more like crispy crepes made with rice flour, coconut milk, and stuffed with shrimp, pork, and bean sprouts. The pancake then is wrapped up with lettuce and herbs and dunked in a spicy sauce before being eaten. For your information, it is the turmeric in the ingredients that gives such an eye-catching yellow color to these pancakes. “Banh” means cake while “xeo” is an onomatopoeic word alluding to the sizzling sound the batter makes when it hits a hot frying pan. The attraction of the dish lies not only in its great taste but also in the superior healthiness and simplicity in cooking it using fractured rice grain. Sellers can even rub the rice grains until it gets broken. 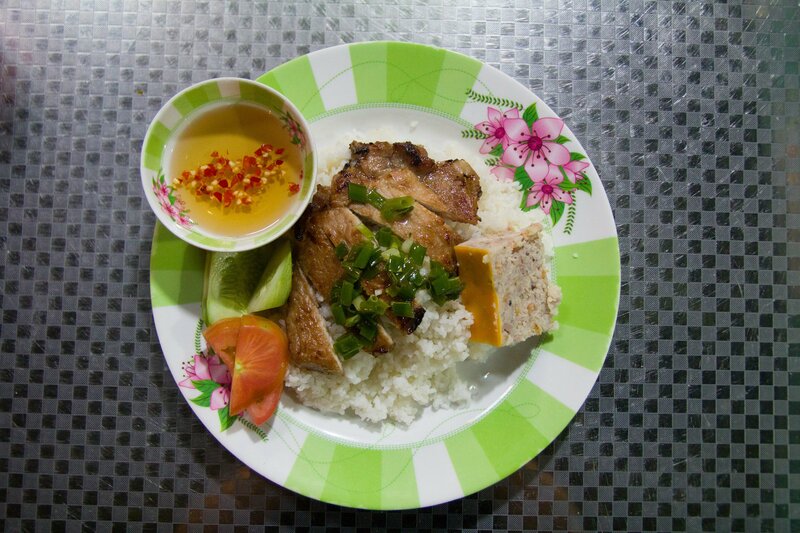 This makes com tam quite different from other Vietnamese dishes prepared with normal rice. 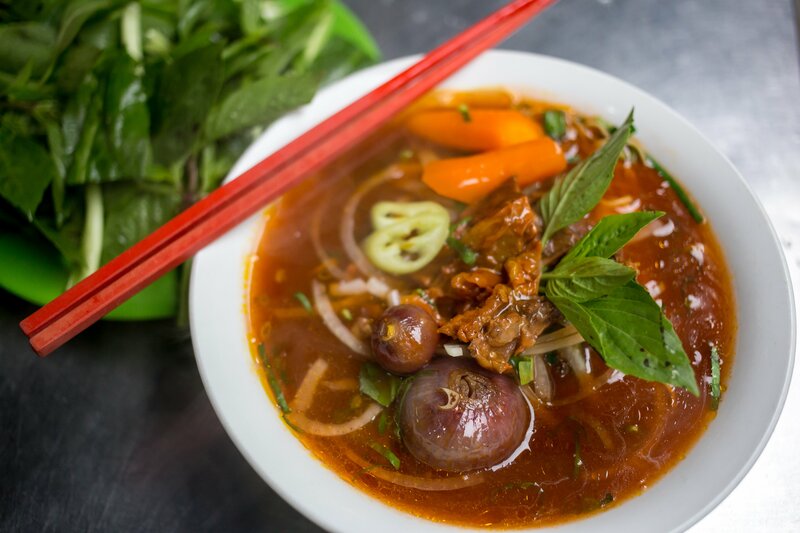 Bo kho – is a famous Vietnamese-style beef stew, and comes in many versions as the recipe varies from region to region. But commonly, people eat bo kho with crisp baguettes, rice or flat rice noodles, and usually a touch of lime juice, making the dish all the more delightful. The stock is absolutely delicious and is infused with various spices and fresh herbs. 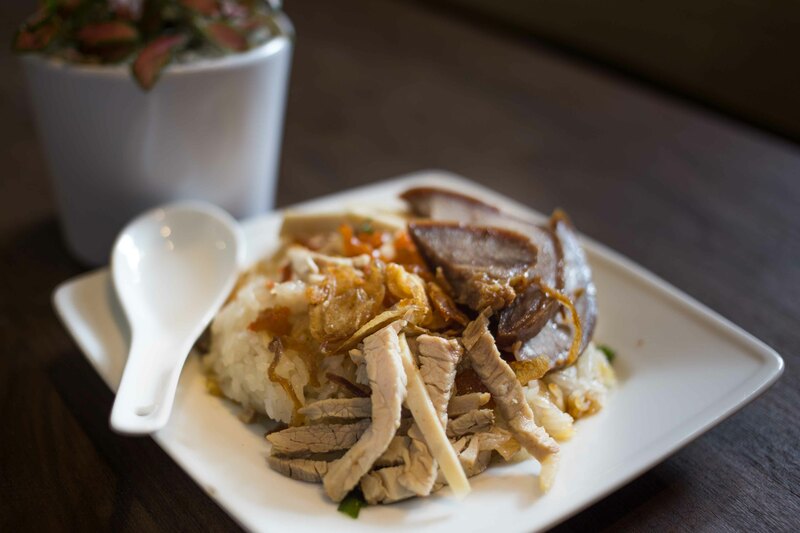 As simple and convenient as banh mi, xoi (Vietnamese steamed sticky rice) is our next on-the-go eating suggestion. 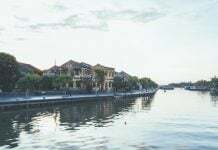 Walking along the streets in any Vietnam’s city, you will easily encounter female vendors carrying bamboo poles with hanging baskets at both ends, skillfully balanced on their shoulders. Many of these women make their living with daily sticky rice baskets. Regarding its taste, there are basically two types of xoi: xoi ngot (sweet version) and xoi man (savory version). Skillfully wrapped in a banana leaf, topped with grated coconut, mashed mung beans, and delicious sesame seeds, xoi ngot is definitely a good choice as a non-meaty option. Yet, if you like a more savory dish, then xoi ga (chicken one) or xoi thap cam (chow mein topped one) should be bought. Travelers come to Vietnam with an intention of seeing its surreal landscapes of which the country has no shortage. However, your itinerary of Vietnam is undoubtedly incomplete if you do not make it a priority to eat the local dishes mentioned above. 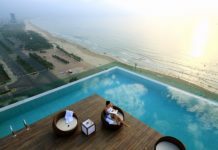 Enjoyed this article and want more fun information on what to do, see and eat in Vietnam? Follow us at the Christina’s blog!